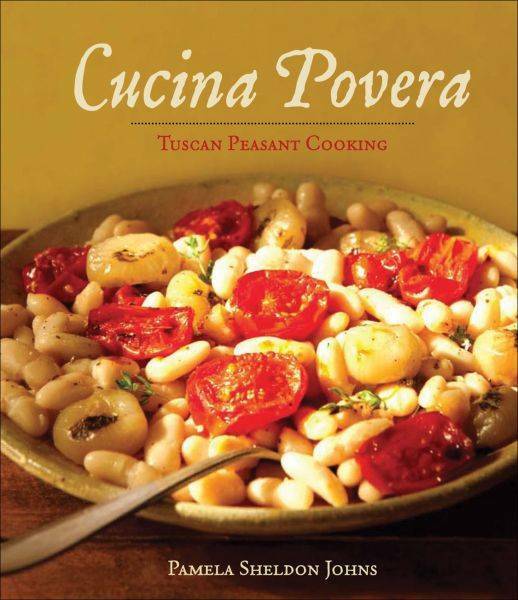 Si stava meglio quando si stava peggio is the theme of Cucina Povera, a new cookbook by Pamela Sheldon Johns. Translated as ‘we were better off when things were worse,’ the proverb refers to a time when Italians were so poor that food was scarce, yet what they consumed was healthy, unprocessed and full of flavor unlike so much of what we are faced with today. The book, which includes 60 recipes and many photographs in both color and black and white, is a nostalgic look at those times and their culinary legacy in Tuscany today. Chestnuts are a good example. Not only were the nuts sweet and delicious when freshly roasted, they could be dried and ground into flour to bake into bread or simmered into polenta. Honey made from chestnut flowers was prized for its distinctive flavor and eaten with fresh ricotta. The chestnut wood made furniture and barrels, leaves were used for animal feed, and even the husks of the nuts were used as fuel. The recipes in this book reflect this philosophy of making do and using up every scrap. A frittata is made with wild greens like dandelion and the author suggests adding leftover pasta or potatoes. Necci are crepes made with chestnut flour and filled with ricotta. Spaghetti is topped with homemade stale breadcrumbs seasoned with garlic, olive oil and hot pepper while a tegamaccio, or freshwater fish stew is made with the catch of the day. Preheat the oven to 400°F. Lightly oil a small roasting pan or heatproof casserole. In a small bowl, combine the herb mixture with the garlic. Loosen the skin of the breast all over the chicken and spread the herb mixture under the skin. Rub the chicken all over with the olive oil and season with salt and pepper. Place the chicken on its side in the prepared pan and roast for 15 minutes, then turn and roast on the second side for 15 minutes. Turn the chicken onto its back and roast for 30 minutes, or until the chickn tests done. Transfer the chicken to a serving platter and keep warm. Set the roasting pan over medium heat and add the wine, stirring to scrape up the browned bits from the bottom of the pan. Increase the heat to high and cook to reduce the liquid by half. Drizzle the pan sauce over the roasted chicken and serve at once. adapted from Cucina Povera (Andrews McMeel Publishing).